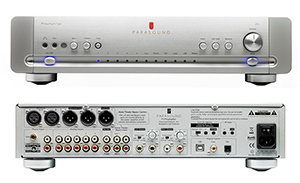 The P 5’s coaxial and optical digital inputs accept sampling rates up to 192kHz, while its USB input accepts up to 96kHz. The MM phono input is said to be compatible with all moving-magnet and most moving-coil cartridges, and has a 100-ohm/47k-ohm switch for impedance matching. The Halo P 5, which is available in black or silver, is priced at only $950 USD and will be available in September.